This is my new favorite way to eat chicken. It seriously made me fall in love with chicken! I ate it, but I wasn't ever a huge fan (except for that BBQ chicken I made a few weeks ago). This just sealed the deal. I'm doing The 21 Day Sugar Detox so I left out the honey this time, but I would normally include it. Deliciousness either way! 1. Preheat oven to 400 degrees. These can also be grilled if you want crispier crunchy bacon. Nom! 2. In a large bowl combine the chicken strips, cilantro, mustard and honey. You can add other seasonings at this point if you want. Black pepper, garlic powder, etc. Combine well with your hand. 3. 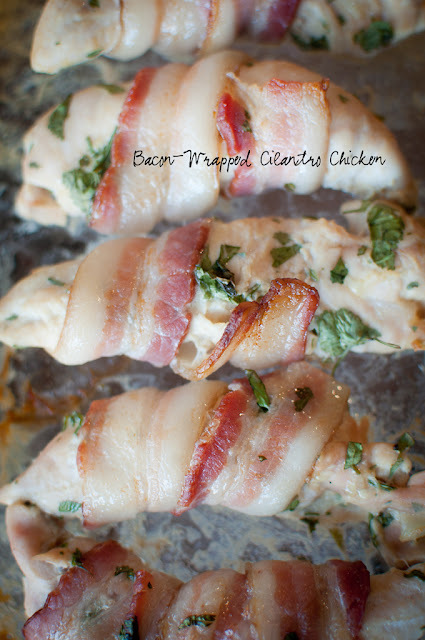 Wrap each piece of chicken with a half strip of bacon and lay in an un-greased baking pan. I used a glass Pyrex dish. 4. Pop them in the oven and bake for 30 minutes or until the juices run clear.